Luiz Hara, a.k.a. The London Foodie, has become a household name for his innovative flavour combinations. 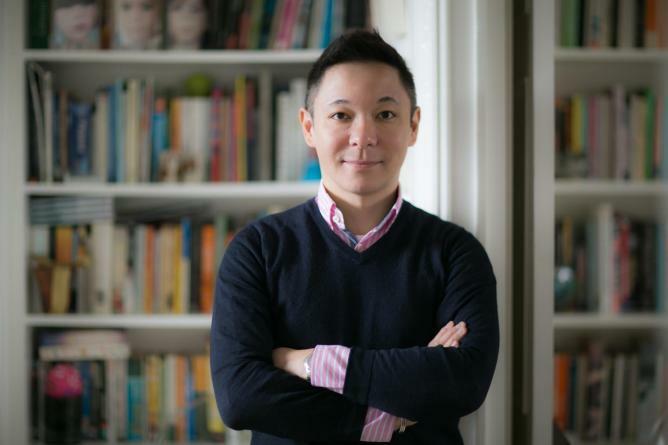 His multicultural heritage (Italian–Japanese Brazilian) is reflected in his food as he strives to fuse different influences. 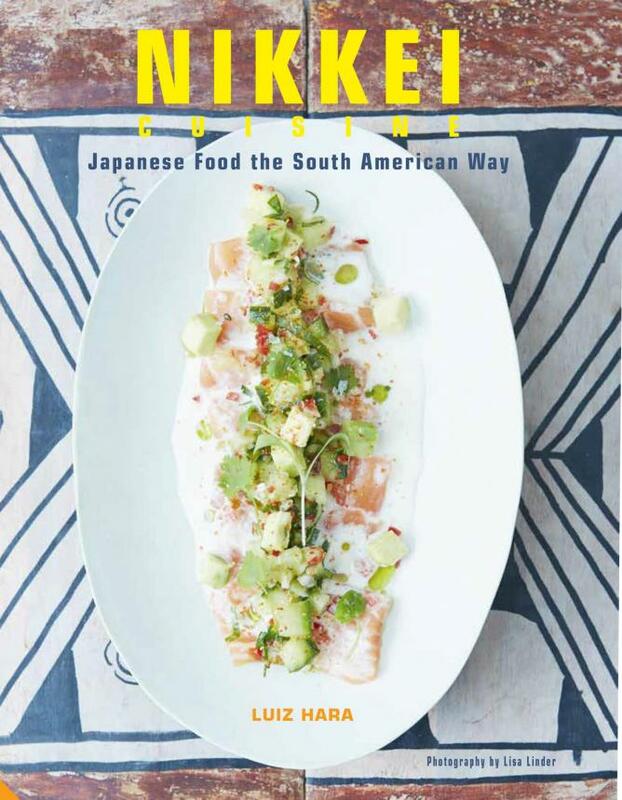 On the release of his new cookbook Nikkei Cuisine – Japanese Food the South American Way, Hara shares his recipe for Salmon and Passion Fruit Tiradito. The world is your oyster when it comes to seasoning tiradito. Much as I love using lime as a major component for Nikkei leche de tigre (Nikkei tiger’s milk), there is a whole range of different fruits to play with. 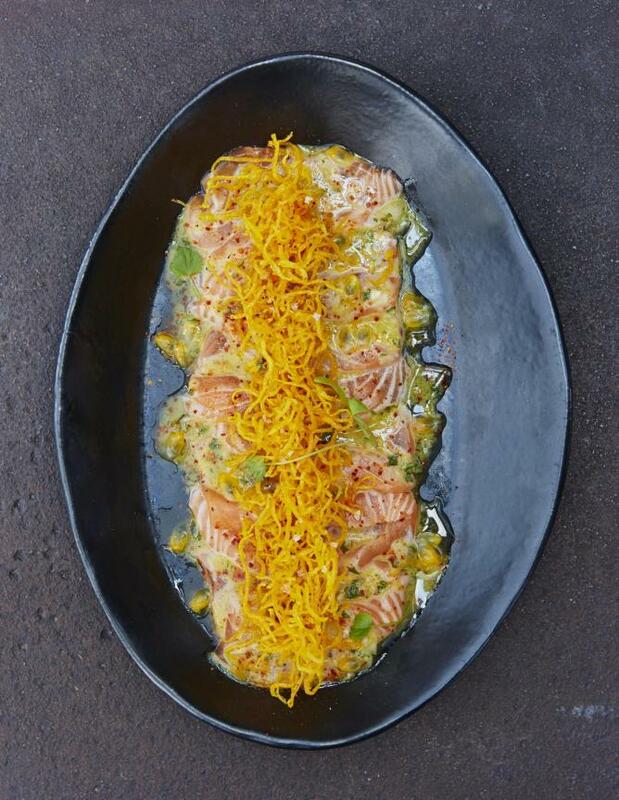 So, here I use passion fruit and aji amarillo (a Peruvian yellow chilli) to create a zingy, punchy dressing that works really well with the fatty salmon. Finish the dish with a dusting of finely ground Espelette pepper for a gentle, fruity hint of chilli. Salmon & Passion Fruit Tiradito | Recipes and images extracted from Nikkei Cuisine: Japanese Food the South American Way by Luiz Hara. Photography by Lisa Linder. Published by Jacqui Small (£25). First, make the passion fruit leche de tigre. Reserve 1–2 tablespoons of passion fruit seeds and set aside. Then whizz the remaining ingredients (except the shallot and chervil) in a food processor. Next, pass the mixture through a fine sieve (strainer) and then add the finely chopped shallot and chervil. Refrigerate until needed. Next, peel the butternut squash. Using a zester, cut fine strips of squash rather like spaghetti. Line a plate with kitchen paper (paper towels). Add the oil to a deep pan no more than one-third full (the hot oil will rise to the surface as the squash is added) and heat to 140C (275F). Deep-fry the butternut squash ‘spaghetti’ for about 2 ½ minutes until lightly browned, transfer to the lined plate. The squash strands will not be crispy at this stage but don’t worry – they will crisp up as they cool. Season with sea salt. Remove any residual brown flesh from the salmon fillet. Cut the salmon into thin slices and arrange them in a single row over each of four serving plates. For each plate, spoon 2–3 tablespoons of the passion fruit leche de tigre over the salmon, dot the reserved passion fruit seeds around the plate, arrange a line of crispy butternut squash ‘spaghetti’ in the middle of the salmon row and scatter a few sprigs of chervil over the squash and on the plate. Sprinkle over some sea salt flakes and Espelette pepper and serve immediately.